So did you know you can banish pet hair from your clothes or furniture with the swipe of a dryer sheet? Just read this in print in Readers Digest and online in Southern Living. Next to the Bible there are no more trusted sources in the South. My friend KariAnne is a genius at decorating hacks: super cute low-cost décor for her home. It was fun to read her new ideas (like using drop clothes for casual curtains) when I dropped into Thistlewood Farms . As I mentioned last week, I recently did a Spiritual Gifts Inventory and found it helpful to see the list of the many gifts I don’t have. It takes the pressure off! Our pastor reminded us we’re also accountable to use the specific gifts we have been given. 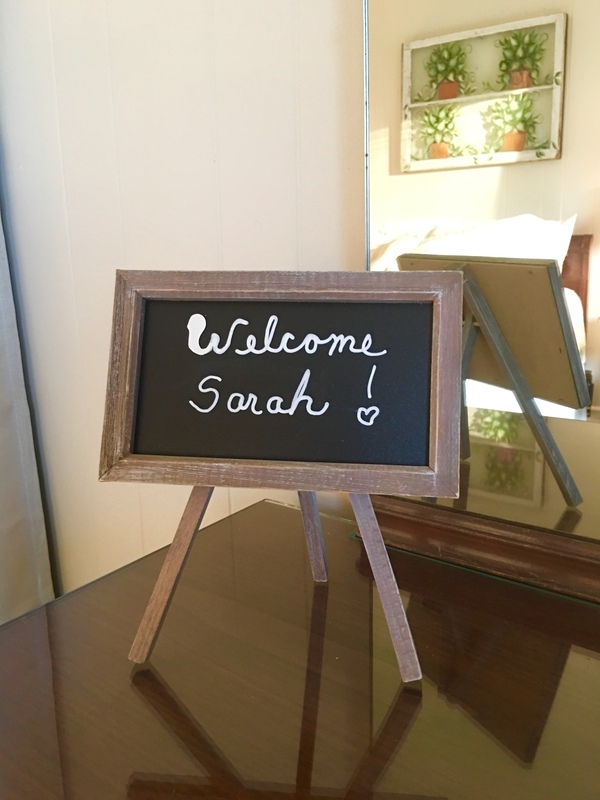 Hospitality continues to be one of my passions, and I welcome little things I can do to make guests feel welcome without straining our retirement budget. 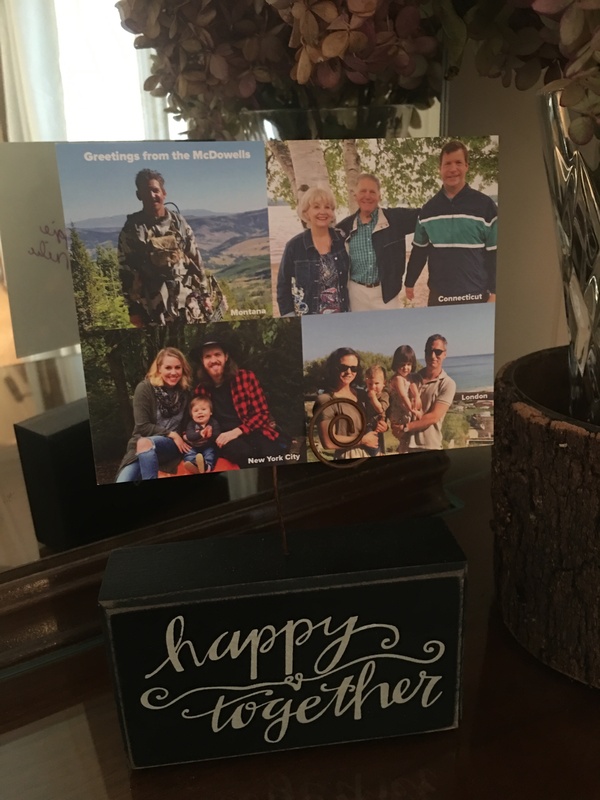 I also had a little “Happy Together” photo block gifted to me, and enjoy using it to display a color photo or two of arriving guests. We’ve started saving Christmas card photos the last few years for that exact purpose. You can also print friends’ photos off Facebook using your color printer. Meal planning can be the most puzzling part of hosting guests, but you can take the guesswork out of the process by developing a few tried-and-true menus. I like creating meals around what’s in season at our local Farmer’s Market, but during the winter months I rely on pulled pork in the crock pot, homemade chicken pie from the freezer or my sister-in-law Lori’s spaghetti pie, which serves a crowd. We served this to friends with kids who stopped overnight this past weekend on their spring break trip to Florida. Add a hearty green salad and garlic toast and you have an easy-to-prep meal. 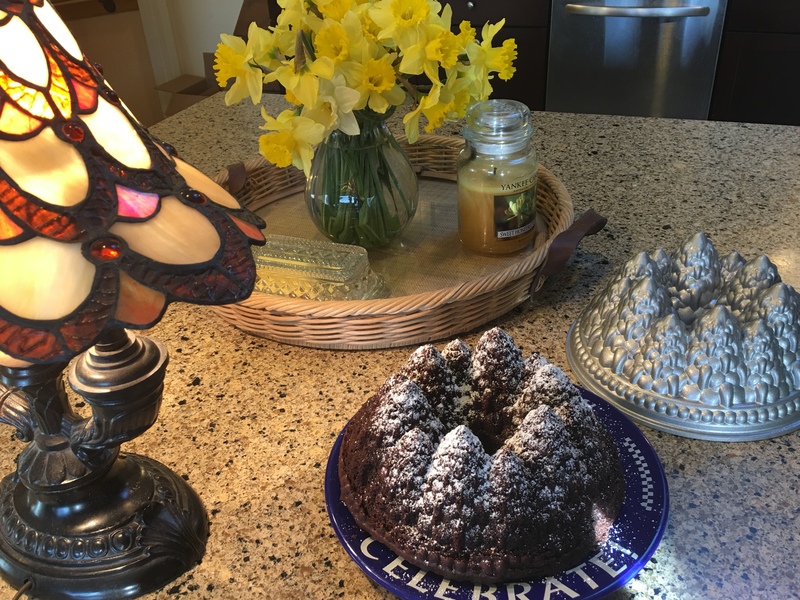 My go-to dessert to welcome guests to Peace Ridge is a simple chocolate cake with Ghirardelli chocolate chips made special by baking it in a Pine Forest bundt pan. Sift powdered sugar ‘snow’ on the peaks, then serve with plenty of whipped cream and hot fudge sauce. Maybe raspberries too in season. Biblical hospitality, though, goes beyond clean sheets and welcome mats. It’s a topic I’ve often addressed online because I believe in it so strongly. As author Karen Mains wrote decades ago in her classic book on the subject, it’s about having an open heart as well as an open home. Hospitality is welcoming the stranger and the refugee. It’s about issuing an invitation to the quiet older man who can never invite you back as well as to friends likely to reciprocate. It includes welcoming new folks to your church home, your community and your country. And a relatively new thought for me? Hospitality is a matter of the head as well as the heart. It’s about entertaining new ideas and thoughtfully considering other points of view. Being slow to speak and even slower to take offense. You might not invite those new ideas or alternate views to take up permanent residence. But you’re not afraid of them either. Personally I learn so little when I speak, but I learn so much when I listen. Do you have favorite hospitality hacks? Please leave a note in the Comments section so we can learn from you too. Maureen, I love this idea! Blackboard paint is an awesome medium as it’s so easy to change up. I love the set of chalkboard markers I got at Michael’s as they have a finer point than chalk. Great way to share Scripture too! Katherine, I’m glad this was helpful! I love learning from your posts too. I love this article, Maggie, and hope lots of people share their ideas. *we have night lights in strategic places so guests can find their way to the bathroom – or to the kitchen for a midnight snack! *we have extra charging cords in the guest bedroom for iPhones/iPads, etc. *we used to have candles in the guest bedroom but became aware of allergies. So we have a diffuser with high-quality essential oils such as Doterra’s Lavender to aid in relaxation and sleeping. Darlene, these are fabulous ideas. I never thought of having extra charging cords in our guest rooms. I love the diffuser idea too. Thank you for sharing and teaching us all! Pat, you are such an encourager. Thank you for reading and commenting! Maggie, Pat Langley has been sharing your blogs which I’ve enjoyed. We were surprised to hear about you and Mike moving to North Carolina. Alan and I are strongly considering moving to North Carolina as well. Where are you living? We stayed n Cornelius on Lake Norman last spring and liked it. thanks for your note, Kathy. We live in Western North Carolina just off the Blue Ridge Parkway about 30 minutes from Great Smokey Mountains National Park. Everyone we’ve met seems to truly love living here. The temperatures are moderate and the seasons change more quickly than up North!